If you are considering filing bankruptcy, you likely have questions about bankruptcy exemptions. You may be worried about losing your home, car, and other personal property. However, by strategically utilizing state or federal bankruptcy exemptions, you may be able to keep your possessions. A skilled bankruptcy lawyer can evaluate your situation and help you understand your legal options. Making decisions about bankruptcy exemptions should not be done alone. Let Allmand Law Firm, PLLC guide you through the process and achieve financial success. Call us today for more information about how we can help you. Many believe they will lose everything if they file for Chapter 7 or Chapter 13 bankruptcy. However, you should know that this is nothing more than a common misconception. In Texas, debtors can use either state or federal bankruptcy exemptions to protect their property—up to a certain dollar amount. While all states have their own exemption laws, if you file for bankruptcy in Texas, you have the option to use either state or federal property exemptions. You cannot use both, which is why it would be wise to discuss your options with a Dallas bankruptcy attorney at Allmand Law Firm, PLLC before moving forward with your bankruptcy case. To learn more about your options, call us for a free bankruptcy consultation! If you elect to use state bankruptcy exemptions, you may be able to protect the entire value of your home. Texas offers an unlimited homestead exemption, as long as your property does not exceed 10 acres in a city, town, or village or 100 acres elsewhere. If your rural homestead is occupied by a family, this limit is doubled to 200 acres. Additionally, if you sell your house, the proceeds from that sale are exempt from your bankruptcy for up to six months after the sale. This is important if you sell your house to reduce cost of living or cannot afford the upkeep on your home any longer. Because this exemption is only good for six months after the sale of your house, it’s important to contact a bankruptcy attorney right away. Texas bankruptcy exemptions are also liberal regarding cars and trucks. The Texas Motor Vehicle Exemption law allows you to exempt the entire value of one motor vehicle per licensed household member. Additionally, if an unlicensed person relies on someone else to operate a vehicle, that vehicle may be exempted. It can be difficult to determine how many motor vehicle exemptions state law allows you. At Allmand Law Firm, PLLC, we will review your situation and help you obtain the maximum number of exemptions under the law. Texas exemption laws allow you to exempt the entire value of one motor vehicle per licensed household member, as well as up to $100,000 in personal property per family or up to $50,000 if you are a single adult. For example, if you and your spouse file bankruptcy and have $150,000 in personal property, only $100,000 of that property will be exempt. The other $50,000 will have to be handled through the bankruptcy, which may mean liquidation to pay debts. A skilled bankruptcy lawyer can review your property and help you retain as much of it as possible through bankruptcy exemptions. It is also important to note that both Texas and federal bankruptcy exemptions can be doubled if you and your spouse file jointly. You would each be entitled to your own exemptions, making it possible for you to protect double the amount of property. Both state and federal law allow you to exempt most pensions and retirement accounts that are tax-exempt. If your pension or retirement account is exempt from taxes under the U.S. Tax Code, it likely qualifies for bankruptcy exemptions. A skilled bankruptcy lawyer can review your pension or retirement fund and determine if it qualifies for bankruptcy exemption and tax-exemptions. Many companies and organizations offer creative retirement plans. You may be unsure whether your pension or retirement account qualifies for bankruptcy exemptions. It is best to gather your documents and have an experienced bankruptcy attorney evaluate your accounts prior to filing for bankruptcy. Some benefits through insurance companies offer you monetary payments or accumulation. Those benefits may be exempt under Texas or federal law. In many cases, it is necessary to report these assets in your bankruptcy. However, an attorney can help you seek bankruptcy exemptions of your insurance policies and benefits. Fraternal benefits through societies such as Freemasons, Knights of Columbus, Elks, etc. If you are an insured person or beneficiary of a policy that has paid out any amount, then you may wonder if that amount is exempt from your bankruptcy. The answers to these legal questions can be complex, and also depend on the status of the insured and the policy itself. A knowledgeable bankruptcy attorney with extensive experience handling these matters can answer your questions. Are Lawsuit Verdicts and Settlements Exempt? If you have recently obtained a lawsuit verdict in your favor or settlement from a legal claim, that amount is not likely to be exempt under state nor federal law. Further, any pending claim may also be considered when you file bankruptcy. You would disclose this information in bankruptcy paperwork when you submit initial filings. However, you may have options to seek bankruptcy exemptions of financial legal claim proceeds. Federal law allows a “wildcard exemption,” explained below. You can use this for any personal property up to a certain amount. If your legal claim proceeds are larger than the wildcard exemption allows, you may be able to transfer that money to a trustee or another beneficiary. 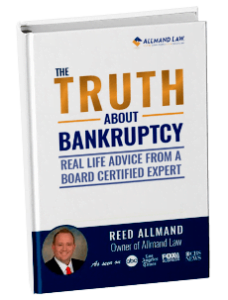 Allmand Law Firm, PLLC can make sure you get the maximum amount of bankruptcy exemptions while fully complying with the law. Should I Use State or Federal Exemptions? You can apply a wildcard exemption to any property that you own. With this, you could exempt up to $1,225 plus any amount left over from the homestead exemption, up to $11,500. If you do not claim your full homestead exemption under federal law, you would have up to $12,725 that you could apply to any of your property. Although you may be dealing with difficult financial matters, you are likely concerned about retaining the belongings that you worked hard to obtain. Your home, car, and other personal property may be exempt from asset consideration in a bankruptcy. In order to find out more about your bankruptcy exemptions, call Allmand Law Firm, PLLC today. Find out which type of bankruptcy exemptions would most benefit you by speaking to our bankruptcy lawyers in Dallas. Call our office today to get started!